More than a week after being hit by Typhoon Haiyan (Yolanda) in one of the worst natural disasters in recent history, survivors of the central Philippines have basic needs of food, water and medicine, shelter, evacuation, communication and power. The Philippines Amateur Radio Association (PARA) and its Ham Emergency Radio Operation (HERO) network continue providing emergency communications, and at the request of authorities is starting to expand its locations and facilities. Ramon Anquilan, DU1UGZ, Vice Chief Operating Officer of PARA, confirms that HERO stations are continuing to work. He thanks the world for keeping 7.095 MHz clear for urgent traffic. Working with the National Telecommunications Commission (NTC), and the National Disaster Risk Reduction and Management Council (NDRRMC), PARA is looking at potential sources for needed communications equipment. PARA also had two representatives present at a meeting chaired by the Commissioner of NTC, Gamaliel A. Cordoba. Anquilan said the NTC has requested that communications coverage from Borongan be expanded to the adjacent town and further. The idea is to set up an HF station in the farthest town that can be accessed. "Given the new task that NTC wants us to meet, we will be needing stations that can be deployed and dismantled at a moment's notice. On the excellent offer of the ARRL, I have requested it to provide at least four HF stations and a repeater." Anquilan said that the PARA/HERO effort "is going now to the difficult phase. The operators that are needed should come from the outside because our locals will not budge from their locations as they have to fend for themselves and their families - they are victims too of this disaster. There are other willing radio amateurs but usually they don't have the proper equipment." Anquilan reported that in one of the worst hit areas of Tacloban (where 90% of its buildings have been lost), the Negros Oriental Radio Assistance Dumaguete (NORAD7) team is on its way to provide an additional HF station. "The team is bringing much needed relief goods along with operators Rey Boy Manaay, 4D7DSW, and Eric Mite, DW7DTR, who are trained in rescue. Experienced operator Darwin Torres, 4F1FZE, is joining the efforts at Tacloban and is expected to improve VHF coverage in the area, and extend HF coverage as well. Torres is embedded with a relief team from Manila." Please see also the extensive coverage of the disaster and response on the ARRL web site: http://www.arrl.org/news-features and especially the latest issue of the ARRL Letter, November 14, 2013. Just posted to the ARRL web site news: MARS 48 Hour Test Deemed "Unequivocal Success." The MARS station at ARRL's Maxim Memorial Station, AAN1ARL, took part in the November 3-5 exercise, which, the Chief of Army MARS said was "designed to test and stress our networks and our members' ability to process and respond to a variety of message traffic." Our Town of Huntington (in northwestern Suffolk County, Long Island, New York) ARES/RACES group employs some of the aspects you discussed in the October 2013 issue of the ARES E-Letter. ICS 100/700 classes are mandatory for all of our members. The EC and some AEC's have taken ICS 200, SKYWARN and CERT training. The CERT class was a great hands-on course, showing what you can do to keep yourself and neighbors safe before first responders arrive. Our deployment protocol for an event is based on the member's proximity to a key location (fire house, police station, EOC, et cetera). On an as-needed basis, each member will cover the location closest to their QTH -- usually less than one mile away. Only the EC and AEC's operate net control from the EOC. We don't want amateur operators driving around in hazardous conditions. Immediately following an event (the ARRL SET being our last), we debrief and submit an After Action Report (AAR). The AAR is distributed to all members, so that lessons can be learned. In regards to NBEMS as discussed in your last issue, our served agency was impressed with our ability to send ICS forms so easily. We have been practicing weekly sending MT-63 messages via 2 meter FM repeater and simplex. Thanks to the VOA radiogram transmissions, our latest venture now is sending images using MSFK. Our weekly net consists of a 2 meter FM repeater portion followed by a simplex session that alternates between 2 meter FM simplex and 10 meter SSB. Finally the net wraps up with a message being sent on the 2 meter FM repeater with NBEMS. Having the weekly net with different frequencies removes the anxiety of "what frequency do I use?" and "what was your call sign?" Thus, call signs are familiar and don't need to be repeated. Radios are already pre-programmed with the correct frequencies. Any coverage and antenna issues have been corrected over time so that simplex can be relied upon: We are aware of which stations need relays, and work accordingly. The element of surprise (and link failure) is eliminated. The EC and AEC's meet monthly on Echolink. We work out ideas in a conference call forum, from the comfort of our homes. We also use Dropbox to keep our latest ARES/RACES files accessible to all. We keep all training and activity on one night. Since we already run a weekly net, we also removed the monthly meeting for the general membership, and now meet every six months. More members show up when there are fewer meetings. We make sure to have a demo of some kind, to keep interest. For example, last month I showed a Power Point presentation and performed an NBEMS demo. Regarding your MASH UP article in the last issue, in addition to the benefits you mention, both the public and the served agencies need to understand the fiscal value that ham radio provides. The presentation by Art Goddard, W6XD, (http://youtu.be/xmT1BXyZsy8) could not spell out the purposes of our amateur license grants any better. Just as fiscal grant recipients must be held accountable for spending grant money strictly according to grant guidelines, Amateur Radio must do the same. As a long-time employee in the commercial wireless industry, I can assure you that there are many companies licking their chops to bid their billions for the "underutilized amateur bandwidth." As an example of proving the fiscal value of Amateur Radio, recently antenna zoning regulations came under sharp attack in the City/County of San Diego. When draconian antenna zoning changes were proposed, the San Diego DX Club rallied around the cause and clearly illustrated to the City/County the fiscal value of Amateur Radio: the number of hams in the county; the value of their equipment; the number of hours dedicated to served agencies, including them; et cetera. This information was all refined into a simple to understand figure of something in excess of $2.5 million of demonstrable fiscal benefit to the City/County. As a direct result of this action, the City/County backed off the draconian platform and negotiated a more realistic change with local amateurs. application form since its inception. Perhaps the Code is not even the story -- but the sad fact that such common sense statements need to even be made -- that some Amateurs lack the common sense and respect to conduct themselves in such a manner. Fortunately, those numbers are few, but they are significant enough that such statements were necessary. [Editor's note: Here is a great example of a hospital's press release on support by and for Amateur Radio that I particularly enjoyed - K1CE]. LANCASTER, Ohio (November 12, 2013) - For more than a decade, Fairfield Medical Center has partnered with the Lancaster and Fairfield County (Ohio) Amateur Radio Club to prepare for the unexpected. FMC uses an amateur radio repeater along with an antenna to communicate to other operators on a frequent basis. These operators are better known among each other as "hams." These ham operators are called upon to give assistance in the event of an emergency through the Emergency Management Agency of Fairfield County. FMC is not the only hospital that partners with ham operators. The Central Ohio Trauma System (COTS) serves 27 hospitals and has purchased 22 ham radios in 2009 to equip 22 central region hospitals. "Emergency management is a very important topic today and the relationship FMC has formed with other ham radio operators is key to meeting the needs of our community during a potential disaster," said Cynthia Pearsall, FMC chief nursing officer. Communication with emergency responders and the public in general is imperative when a disaster occurs. If landline telephones, cell phone towers or the Internet become inoperable, an alternate mode of communication is needed. That's when amateur radio can become the main means of communication, serving as a backup to emergency responders. "We partner with our local amateur radio club during many events through the year," said Steve Anderson, FMC Center Police chief. "Whether it be a table top emergency exercise to the Lancaster Festival, the Lancaster Amateur Radio Club is a great asset to us. As a ham operator myself, I see the benefit firsthand." Amateur radio is the first mode of wireless communication before cell phones and requires an amateur radio operator license from the Federal Communications Commission. Before receiving a license, you must pass an examination. "Our club appreciates the close relationship we have formed with FMC, Fairfield County representatives, and the city in general," noted John Hilliard, trustee of the Lancaster and Fairfield County Amateur Radio Club. For questions or more information on how to become involved with the Lancaster and Fairfield County Amateur Radio Club, go to k8qik.org or contact Mark Urbine, K8QIK Club spokesman. A hiker in distress in Nevada is thankful that he had his hand-held transceiver along when he found himself stranded in the hills near Henderson. Western Intertie Network (WIN) System member Jim Frederick, KF6QBW, in Arizona reports he was monitoring the system November 3 around midday when he heard, "Mayday, Mayday. Hiker in distress!" from his WIN System repeater. "I grabbed a charged battery for my VX-5, and the call came over the radio again," Frederick says. He responded, and the hiker on the other end, Nathan Rischling, KDØHFM, of Nellis Air Force Base in Nevada, told him he'd misread the elevation on his topographical map, had ended up on a very steep and rough area, had stuck his hand on a cactus, and could find no safe way out of his situation. He had a GPS, however, and was able to provide Frederick with his precise coordinates. Rischling said he had a day's worth of food and water but needed help getting off the mountain, as he would not get back to his starting point before sundown and didn't think his GPS battery would last out the trip. "KDØHFM stated that he did not take a conventional trail and was using a topographical map and GPS for guidance," Frederick explained. Frederick said he knew from experience that a call to the Las Vegas search and rescue would expedite the process, so he put out a call on the WIN System for any Las Vegas station that could make the call. James Freeman, KG7EWP, promptly came back, and Frederick handed off the emergency traffic. Freeman called 911 and spoke with search and rescue, and stood by until the situation was resolved. Within 15 minutes a rescue helicopter was on the way. Frederick kept his ear to the radio until the event was resolved, in case someone needed more information from him, and a few hours later, he overheard Rischling thank KG7EWP for helping "and everyone else on the WIN System for standing by." The WIN System is a series of 90 linked, or inter-tied repeaters -- most on UHF (70 centimeters) -- that cover a substantial portion of California, 16 other states, and four countries around the world. It is owned and operated by Shorty Stouffer, K6JSI. KF6QBW is an affiliated repeater station with the WIN System. The Lake County (Florida) ARES provided radio communications to support a three day bicycle event in Mount Dora, Florida from October 11 through October 13, 2013. The event was the 39th Annual Mount Dora Bicycle Festival sponsored by the Mount Dora Area Chamber of Commerce. Sunny weather prevailed for the three days with moderate temperatures and reasonable humidity so there were no reports of heat exhaustion. There were 703 bicycle riders registered this year -- a slight increase over the past year. Most of the riders were from Florida but there were some from various places in the United States. This is not a competitive race but a series of 15 separate bicycle tours through Lake County, Florida's country side. The county has 1400 named lakes and is considered to be Central Florida's hill country. This combination provides scenic background and significant challenges for the riders which brings them back year after year. The longest ride is 100 miles and the shortest is two miles. One of the most popular is the Yalaha Bakery ride which is a 55 mile round trip. This includes a stop at a German bakery that serves elegant pastries, lunch, assorted drinks and musical entertainment. Another ride ends at a farm that provides the riders a chance to get lost in a large corn maze. 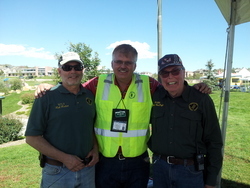 The ARES group had 20 radio operators helping to keep track of the bicycle riders, man rest areas, provide SAG wagons and radio equipped mobile patrol vehicles. The ARES volunteers provided 255 man hours of service over the three days. All vehicles were directed by the net control station N4FLA which had its mobile command trailer set up in the parking lot of the Mount Dora Chamber of Commerce. A repeater provided by K4AUS was used on a frequency of 147.390 MHz. An APRS station and operators kept tabs on the three SAG wagons using the 27 inch video monitor mounted in the trailer. This video system can also be used to monitor weather conditions during any event. A total of nine riders were transported back to the Mount Dora staging area due to mechanical issues or just getting tired out. We had one report of a rider down with what appeared to be serious injuries when he fell from his bicycle. EMS was called and he was transported by air to a local hospital for evaluation. Later we received a report that he was not seriously hurt and was released from the hospital. The Lake Area Radio Association has been providing on course radio communications for the Mount Dora Bicycle Festival for over 20 years. They use events of this type to train their members to be ready to provide emergency radio communications for disaster situations such as hurricanes and tornados which are not uncommon in this part of Florida. Members volunteer their time, radio equipment and vehicles as a public service to the community. Season's greetings from your editor! I get the impression sometimes that readers are under the impression that I must have to sort through thousands of contributions of pages of after action reports, exercise lessons learned, opinions, criticisms and compliments, brickbats and bouquets to come up with each month's issue of this newsletter. That is not the case. As I work through the course of the month to draft a new issue, it is usually a job of searching for and pulling relevant material from various sources on the Internet. I look at the ARRL and IARU web sites, the ITU resources, FEMA training and CERT information, and ARRL Section and ARES web sites. The point is, I could use a lot more material directly from you, the reader. Chances are, if you have a solid opinion or report and you write it up fairly well, I will use it in the newsletter! So take a chance at gaining your 15 minutes of fame as 37,000 readers will see your story and call sign! Write for the ARES E-Letter! 73, Rick Palm, K1CE, Daytona Beach, Florida, the "World's Most Famous Beach"